Most cultures have their own variation of the succubus, the legendary animalistic woman who draws men to their doom with her sexual allure, and the Sámi people of northern Finland are no different. 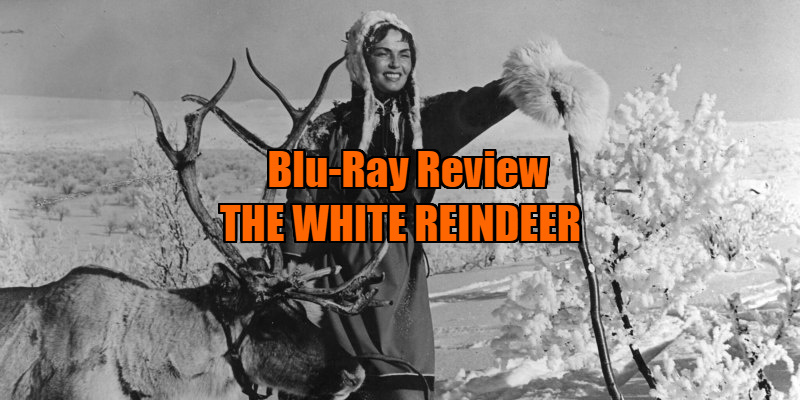 For his 1952 narrative directorial debut, The White Reindeer, documentarian Erik Blomberg tells the story of a woman whose sexual impulses unleash a dormant supernatural power that has resided within her. The White Reindeer opens with the birth of a female child, who, as the accompanying folk song informs us, is a witch. Years later, said infant has grown into the adult Pirita (Mirjami Kuosmanen), who marries a young man after a playful seduction in the snow following a reindeer race. With her husband away on hunting trips for long stretches, Pirita is tormented by unfulfilled sexual desire. Hoping to remedy her situation, she visits the village shaman, who concocts a poultice that he claims will make her irresistible to the men of the village, who must be a rather picky lot, as Pirita is far from unattractive. The shaman is shocked when Pirita displays paranormal powers during his ceremony, causing a stone to levitate and breaking the skin of his ceremonial drum. Instructed by the shaman that she must kill the first living creature she comes across to fully harness her power, Pirita returns home and is surprised to find her husband has returned, with a gift for his wife of a rare white reindeer. That night, Pirita sneaks away with the animal, which she promptly sacrifices. The side effect is that Pirita now has the ability to shape shift into the form of the white reindeer, and thus begins her campaign of seducing and murdering the men of the town. Blomberg's documentary background is visible from the off here. Much of his film is distantly observed, as though the filmmaker is trying his best to remain impartial while telling his story. Its lengthy wordless stretches resemble a work of the silent era. Indeed, given its setting of a community that has refused to enter modernity, the film has a timeless quality, falling somewhere between the documentaries of Robert Flaherty and 1950s European arthouse filmmaking in its visual aesthetics. Blomberg holds his story and protagonist at arm's length for so much of the film that it can be difficult to get sucked into the progression of either. It doesn't help that while Blomberg's direction is for the most part detached, the overbearing and incessant score by Einar Englund insists on telling us how we should feel at any given moment. When Blomberg is less objective and more emotional in his filmmaking, he produces a couple of startling moments. When Pirita sacrifices the reindeer, the snowy earth around her gives way to a graveyard of antlers and a stone monolith that looms over her, a physical symbol of her evolution from human to something more powerful - surely Stanley Kubrick saw Blomberg's film and 'borrowed' this idea for 2001: A Space Odyssey? The most striking image however is simply that of Kuosmanen's stoic visage as Pirita seduces a young man during his wedding ceremony. Blomberg shoots the sequence like the tennis scene in Hitchcock's Strangers on a Train, with Pirita remaining motionless while the congregation around her are engaged in hymns, defiant in her rejection of Christianity. As a narrative film, and especially as a horror movie, The White Reindeer doesn't quite work. Blomberg doesn't do enough to establish the isolation felt by his protagonist, so it's difficult to empathise with her, particularly when she begins her murderous ways, and the movie sorely lacks a relatable figure of innocence that might fall in danger of becoming her victim. But those with a curiosity for a culturally distinctive and feminist spin on the tropes of the vampire/werewolf mythos will find it an intriguing watch with occasional moments of sublime imagery. Feature commentary by the ubiquitous and informative Kat Ellinger; video essay by film journalist and writer Amy Simmons; Blomberg’s 1947 documentary short With the Reindeer; colour test footage; 1952 Jussi Awards ceremony featurette; booklet with essays by film critics Alexandra Heller Nichols and Philip Kemp. 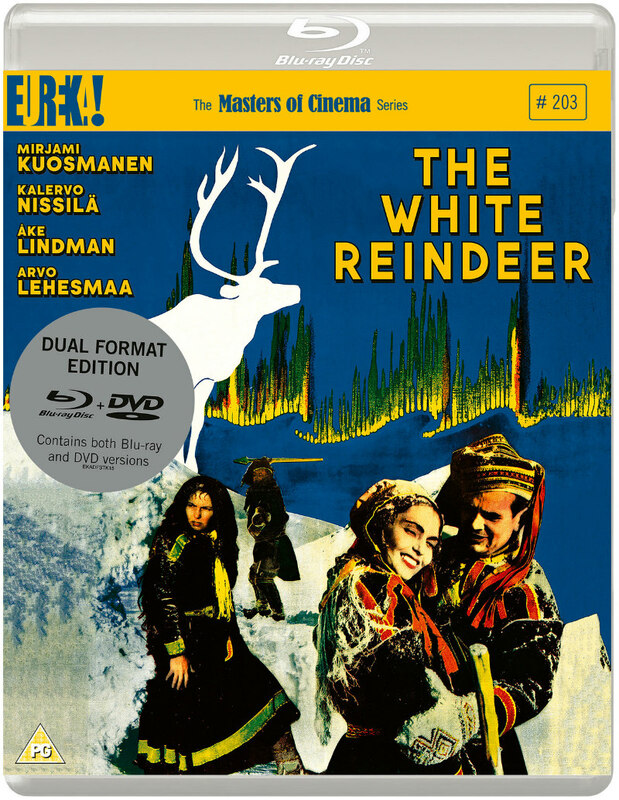 The White Reindeer is on blu-ray April 8th from Eureka Entertainment.